Good New Year to you. Abstained from the blog for the holidays. Some are trying to go gadget-free one night a week at AA type affairs and having to go through deep therapy to cope. You're not reading this in the WC, are you? Like to take my Xmas season right through the Orthodox holidays. And why not? In fact why stop at Xmas? I like the idea of borrowing from the many traditions out there and creating your own eclectic experience. Apply it to Easter, Thanksgiving and so on. The cards are still up(missing about four this year-you know who you are), the tree is still up-naturally artificial, however I did hear rumour of a man with a twenty year old vrai chose. I’m with Stewart Maclean who also keeps his tree up through Winter. These are dark mornings and a little glow of tree light with breakfast is just the thing. After a frenzy of shopping, baking mince tarts (labour intensive but pleased with the outcome), fruit cake and almond bark (amongst others) and prepping for the big day, I went into hibernation mode. Was housebound with the Boxing Day storm, coming up for air on Jan 2. It was a time of gross indulgence-Ceasars, Rusty Nails, red, white, ice and port wines, the 10PM caffeine consumption, plum pudding, triple crème Brie, Stilton, chocolate, Eggs Benedict and The Full Monty breakfasts. Tried on a skirt yesterday and caught sight of my thighs-the horror. Did I move at all from Xmas Eve to the afternoon of the 2nd? Does moving from the dining room table to the Family Room count as exercise? There were stairs involved. I did exercise the old grey cells deciding on which of the two hundred and fifty channels to watch. You see the whole culture in an evening. Caught up with Absolutely Fabulous, Yes, Minister(this does age well), Die Hard I, II, III (I hear we’re about to be treated to IV), Martin Clunes(seems like such a genuinely all round nice guy), The Queen’s Palaces, Craig Ferguson of the Late Late Show on location in Scotland (pick up the movie Born Romantic-he plays a guy with a Dean Martin obsession), Corner Gas, Reality TV-Storage Wars-love Barry, and Come Dine With Me-took all my effort to stay with this one. Fascinating peak at the world. Learned that Britain is churning out a very nice sparkling wine. South Downs-champagne capital of England. It’s all in the chalk. Back to the device thing. On the pre midnight recap of New Year’s celebrations in China and Australia, was anyone actually looking at the fireworks or were they only recording it? I saw only cell phones. It’s important to participate in events not just document, same goes for blogging. Are you participating in the moment or merely logging the events? Interview on Spark this week with a woman who has to actively set aside a day where she is not emailing or tweeting. I would never survive in a Twitter-only world. I find it staggering what people put out there. Recent interview in The Spec asking interviewee what her latest tweet was-“craving croissant and coffee”. I will say, though, that after a recent browse through Indigo, anything and everything is on the market. So if you want to blog or tweet about it, go ahead. Goodness knows, I’m doing it. I recently came across Breathing Treatment Here’s a guy giving weather updates (amongst many other things) from California. Really enjoyed going through the archive-he’s got a bit of everything. Finished off the AGH Napoleon exhibit. Fancied himself as a bit of a Julius Ceasar type. Thanks to the Xmas TVO watching, learned that the silverware at this time was laid face down. Why? All those frilly cuffs. They would get caught up in the tines of the fork. The AGH displayed forks and spoons face down. No need to ask why. Silverware was a big deal during this time. Today we may display wealth with a car or boat, back then it was silverware. Apparently Joseph Bonaparte lived in New Jersey for some time. I think crime lords not French ex-pats when I think of Jersey. Have you finished at the AGH and it’s Shawarma you’re after? North side of King West and Caroline, sandwiched between two Japanese restaurants is a very rustic looking purveyor of kebab and rice. Excellent Shawarma; fresh dressings and a very tidy sandwich which is critical when you're jamming a pita with a dozen items. So January arrived and with it the sun. England had been under a deluge of eternal rain and we remarked that cold and sun are a much better combination than cold, cloud and damp. After a fry up of The Full Monty and a pot of tea, emerged from the house on January 2 to prepare for the coming Work Day. Things to do-mainly clearing the cobwebs. Donned about three layers of clothing and set off into Farm Country. Pit stop at the Stoney Creek cemetery; I like the way the sun was coming through the trees with the late PM sun. Older graves including a War of 1812. Primarily births from late 1800’s. Up into Tapleytown and found a crumbling barn. What a difference snow makes to the landscape. Tour of the Catholic cemetery-fairly recent cookie cutter headstones. A golden Mary greets you at the gate. Next door are two older churchyards-St. Georges and Tapleytown United. Wanted to take a tour of the little one room school house down the road but as a police cruiser was parked up, thought better of it. Home and collapsed by 7PM. Work days a blur and just as well. Ah, the two day work week. If only it were a permanent thing. Finally made it to the AGO and the Frida and Diego exhibit. Time was ticking and one thing you don’t want to do is go on the last day of an exhibit. This runs ‘til the 20th and I would suggest a weekday if you can. Usual issues with any exhibit like this. People going through life with blinders on. There’s always someone going to stand in front of you no matter what. It’s exhausting dealing with humans. It’s my own fault. I did not read the fine print for the 28thtelling me that I had to book in advance. Could have taken a much quieter tour but perhaps next time when the Renaissance comes to town. Xmas week is the ideal time to be in Toronto. Most of it’s shut down and it’s quiet and calm on the streets. Walked from the Esplanade & Front to McCaul & Dundas. Far enough in a cold climate. Interesting how the AGO operates versus the AGH. Here I show my little paper membership card and I’m given an entrance sticker. End of story. There, I have to present my heavy duty membership card, photo ID and specify what exhibits I want to see. At the exhibit, I’m asked for my ticket, membership and depending on the mood, id. Is this an Art Gallery or Putin’s Inner Circle? 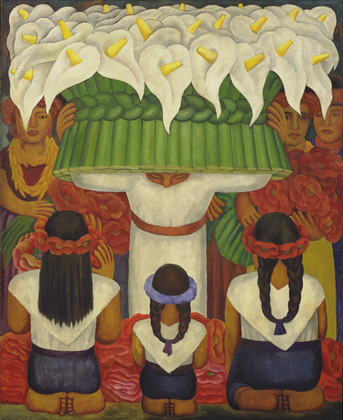 I’ve always appreciated Frida Kahlo’s paintings, but didn’t know very much about Rivera. Enjoyed his self portraits, landscapes, Woman With Flowers, Feast of Santa Anita, Dance of the Sun and Calla Lily Vendor. There were a lot of photographs of the two artists, my favourite being by Mary Lou Packard. 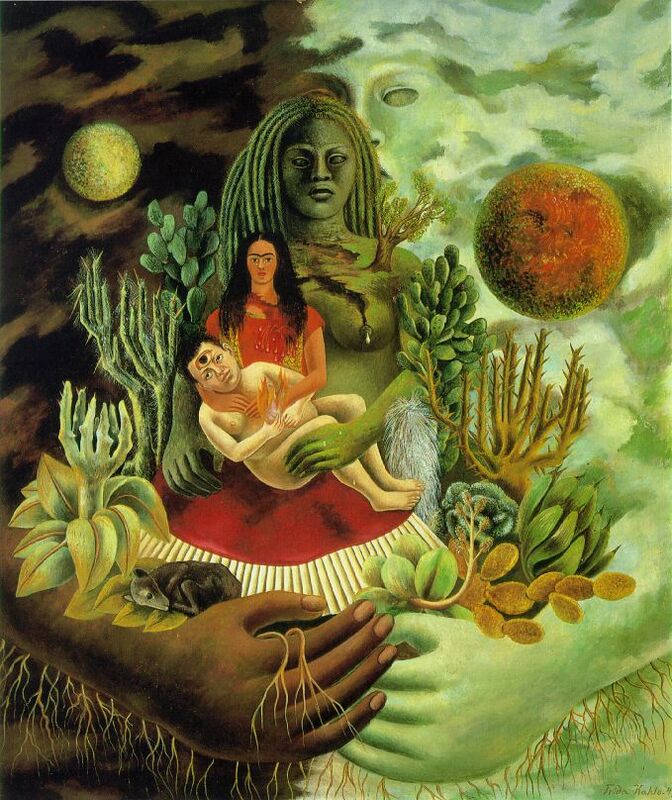 Favourite Kahlo painting is Love Embrace of the World (below). Viva the uni-brow and moustache!! Emerged from the chaos into a virtually empty, calm, cool, green room of African art. Ahh. Advice for this gallery? Get a membership and take it one exhibit at a time. Once again, the muffins were dynamite. Dundas West is a great stretch of road for restaurants. Side by side Caribbean, Middle Eastern, Japanese, Korean, Chinese and Thai. Try a moveable feast-a little nibble of everything. Start with some soup in one place, then sushi at another and finish with falafel somewhere else. Went with hot and sour soup. Delicious. Would like to see “real” chicken in Asian dishes. I’m told it’s injected with water to plump it up and tenderize it but it’s not a good mouth feel. Indian restaurants have the real thing. You can tell the difference. Someone from the street wandered in and made a B-Line for the kitchen. She was quietly escorted out. Meandered back through the mall. Can someone explain the appeal of a Coach bag? Why is it that the higher the price tag, the uglier the bag? I spied a messenger bag in men’s wear. I couldn’t resist looking at the tag-$400 for a bit of leather. The Men’s section is definitely more stylish than the women’s, though and should it have fit my budget, it would make an ideal carry-all for a day like Saturday. Finished up the day with a spiced latte. A Starbucks? Yes, I know I said I wouldn’t go chain on this trip. Church pews for seats and Diana Krall in the background. People on first name terms here and it was the only spot (apart from my attempt at humour on Queen Street, which generated one smile from a fellow pedestrian) that anyone spoke. The Urban Experience. I remember meeting a friend in town some years ago. She’s from Farm Country and was doing a few semesters in TO. She’d gone Urban overnight. “You don’t make eye contact,” she said. We were on the Subway at the time. I like to stop and look around. Staring at the pavement gets boring, fast. I defiantly asked for a MEDIUM. “You mean a GRANDE?” he asked. Try this link. Letter to Starbucks Great piece on making sense, if you can, of the sizing system at Starbucks. A server was giving away the stale scones. Even she wouldn’t eat them. What did I spy amongst the laptops and cellphones? A person writing with paper and pen. Could it be? So I am not alone here. I'm never without my little notebook. Had sat down to pen something before now, but, with the announcement of the death of the young Indian woman, it hardly seemed the time for my sarcasm and flippancy. The reality is there is never a good time. Death, torture and suffering are a daily occurrence. This will not change. Mother and child found dead in the trunk of a vehicle, four dead in Kabul due to book burnings, gay man beaten to death by man on one hour pass from psychiatric hospital, 200 elephants slaughtered for ivory, Mitt Romney running for president (alright, that’s not quite in the same league, but imagine, Dear Reader, if he had got in). We complain about our little lot in life, seemingly oblivious to the “bad” things out there. But we do acknowledge these things, we do what we can to try to change a situation-be it domestic or otherwise and we get on with our lives because, as it states above, we need a pressure valve for the brain. Writing about excessive self indulgence is OK. Instagrams of your child eating broccoli, Tweeting about the movie you’re watching and sharing milestones is OK. It is how we sustain ourselves amidst the chaos around us. And what has sustained me these last twelve months? "New Year reflection? Thought you didn’t believe in that sort of thing," I hear you saying. Apart from Letterman, saw only one published “Best Of” list for 2012. Much improvement; clearly everyone got my memo.